Allyson Gofton will feature in the latest Creative Tauranga Charitable Trust's “A Spendid Evening with …” series at the Tauranga Club on February 14th. Gofton's been in the country's kitchens and dining rooms for about 30 years now, and after a year living and writing in Caixon at the foot of the Pyrenees, she has become a Francophile. “We can learn a lot from them,” says Gofton. That might explain the notion that the French don't get anything done and the economy isn't working. “But on the other hand,” she says, “they live until they are 95 and they are happy. Her book, with anecdotes strewn around the recipes, is called “Recipes from my French Kitchen”. Allyson's favourite is the Caixon lamb – a slow cooked lamb shoulder. But there is also the French country port braise – salted pork belly, pork sausages, chicken wings and haricot beans slow cooked for nine hours in a broth. But for gourmet foodie Allyson, the “serendipitous bonne chance” in Caixon was having foie gras and bean soup cooked for her. Foie gras is prepared from the livers of geese and ducks which have been force fed – it is the scourge of animal rights proponents. Soon Allyson Gofton will return to Caixon - a small village of 350 and a church - to launch the book amongst the artisans who loaned her their knowledge and expertise. 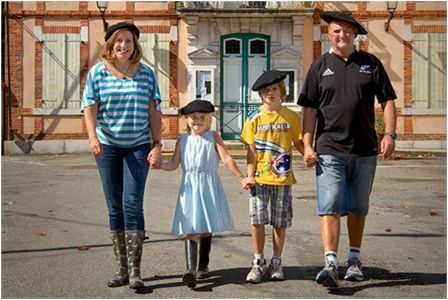 Photo: The bereted Goftons in Caixon town square – Allyson, Olive-Rose, Jean-Luc and Warwick.